Charity is a professional WordPress Landing Page theme developed specifically for all type of Charity, NGO, non-profit organization or foundation, campaign & event donation, religion or a fundraising website etc. This Charity and Fundraising WordPress Theme is an outstanding and beautiful non-profit WordPress theme. It is modern, responsive and mobile friendly wordpress theme. So, no worries there, Google will love it. Theme offers whole variety of cool features like different blog layouts, header options, extensive color options, gallery, latest contact form and more. It is all very easily customizable directly from the WordPress customizer. Above all it is very easy to use, coded according to the latest standards and SEO friendly. 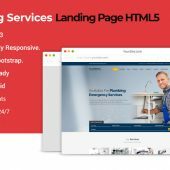 Charity WordPress Landing Page comes with most powerful features you will be able to manage and customize your content with easy drag and drop option. It allows setting up information without any coding skills absolutely effortlessly and sees the changes in live mode. This Charity and Fundraising theme also comes with WordPress fundraising plugin which gives you the ability to create your fundraising campaign on the boost. It has also featured with WooCommerce package so you can create and manage your online store. Charity is SEO optimized and it follows the latest trends and best practices in onsite optimization. Charity comes with unlimited color styles, custom widgets, touch & swipe enabled and much more. Charity is super easy to install and setup and comes with an extended documentation, ready to use page layouts and examples and much more.